The International Day of Peace was established by the United Nations General Assembly in 1981 for “commemorating and strengthening the ideals of peace within and among all nations and people”. Twenty years later, the General Assembly set the date of September 21st to observe the annual occasion as a “day of global ceasefire and non-violence… through education and public awareness and to cooperate in the establishment of a global ceasefire”. This year, 2008, I had the opportunity to be present at the 60th anniversary of the International Day of Peace and to introduce my new film, ‘Rooted in Peace’ to the United Nations. Among the participants were 192 children who each carried a flag representing the nations of the world. It was also the 60th anniversary for UN Peacekeeping operations and its Universal Declaration of Human Rights. The International Day of Peace session was opened by United Nations Secretary-General Ban Ki-moon who rang the Peace Bell at 10:00 am on Friday, September 19th in the United Nations headquarters accompanied by UN Messengers of Peace, Jane Goodall, Elie Wiesel, Michael Douglas, and violinist Midori Goto, appointed as the messenger of Peace that day. United Nations offices and peacekeeping missions around the world also held events to commemorate the occasion with a minute of silence observed at 12 noon local time around the world on September 21st. To encourage even greater awareness of this important day, the United Nations encouraged people around the world to send text messages for peace on or before September 21st. Messages of peace were then collected by the UN who presented them to world leaders gathered in New York for the 63rd General Assembly held on September 23rd, 2008. Stockpiles of toxic mercury kept by industry soon will be stored safely in the United States instead of ending up on the world market where it might pollute the environment. Under bipartisan legislation Congress sent to President George W. Bush Monday for his expected signature, mercury exports would be banned in 2013 and the Energy Department would be required to store the heavy metal permanently. 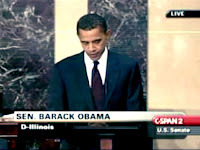 The bill's chief sponsor, Sen. Barack Obama, introduced the bill in response to a 2005 [Chicago] Tribune series about mercury contamination in fish. "We know that mercury can cause serious developmental problems in children and problems affecting vision, motor skills, blood pressure and fertility in adults," Obama said in a statement. "While the United States has improved its efforts to collect and contain mercury, this country remains one of the leading exporters of this dangerous product." Senator Obama, in conjunction with other lawmakers, had previously worked to obtain an agreement from the Energy Department earlier this year to keep its own 2,600,000 lb stockpile off the market. This new legislation will address both the Energy Department's stockpile and the mercury used by industry by requiring its permanent stockpile within the United States. I do NOT wish this diagnosis for Senator McCain. I use the term heartbreaking and Alzheimer's and all forms of dementia are just that and I sincerely hope he is not at effect of it.